AcnEase® will successfully help most Rosacea sufferers to control both external and internal symptoms of Rosacea. AcnEase works by restoring an internal balance rather than targeting individual symptoms. 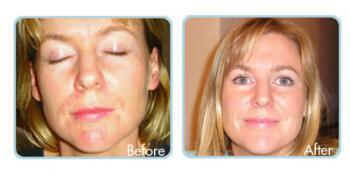 This approach results in high rate of success among Rosacea sufferers around the world. We're confident that AcnEase will help to improve your Rosacea condition, so we offer a money back guarantee! Rosacea is a facial rash that occurs in middle-aged men and women. For Rosacea sufferers the redness or blush can be made worse by the following stimuli: heat, exercise, stress, alcohol consumption, spicy foods, coffee, tea and chocolate. An infusion is made in the same way as one would make strong tea. Rosacea is a facial rash that occurs in middle-aged men and women. Approximately 13 million people in the United States have Rosacea. The cause of Rosacea is unknown, but it affects people mainly in their 30s and 40s, especially those with fair skin, blue eyes, and of Celtic origin. Famous individuals with Rosacea include W.C. Fields, Rembrandt, and President Bill Clinton. Rosacea used to be called "acne rosacea," but it's quite different from acne. The red spots and pustules are dome-shaped rather than pointed and there are no blackheads, whiteheads, deep cysts, or lumps. Sometimes the affected skin is swollen and hot. Rosacea affects the cheeks, nose and forehead rarely the trunk and upper limbs. Facial creams or oils and topical steroids may aggravate Rosacea. In fact, Rosacea sufferers should avoid anything that may cause skin irritation. Redness: The cheeks or forehead appear to have a flush or sunburn. The redness is caused by dilation of the blood vessels in the skin, which allow more blood to flow and pool under the surface of the skin. Pimples: Pimples may appear on the face. The types of pimples seen in people with Rosacea differ from acne, which are characterized by blackheads or whiteheads (comedones). In Rosacea, the pimples appear as small red and solid (papules) or pus-filled (pustules). A characteristic symptom of Rosacea is thin red lines on the face which are called telangiectasia. These red lines are the dilated blood vessels that become distended under the surface of the skin. During the early stages of Rosacea the telangiectasia is obscured by the red color or flushing of the cheeks, once the redness disappears the red lines become more apparent. When Rosacea is left untreated some people, mostly men, may eventually get small knobby bumps on the nose called rhinophyma. Treatment: The earlier you intervene in Rosacea symptoms, the easier they are to control. 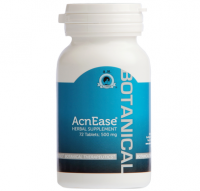 AcnEase has been known to reduce or even completely eliminate Rosacea symptoms for many patients. After the basic course of treatment that can take up from 2 weeks to 2 months, a small maintenance dose of 2-3 tablets twice a day may be recommended to keep the symptoms in check. When initial flare-ups are contained, some patients may even use AcnEase intermittently only when symptoms get aggravated.